This USA and Canada Wall Map would make and excellent Christmas gift for the teacher or traveler on your shopping list this year. This political wall map, which features the United States and Canada, flawlessly illustrates the state and provincial divisions of both countries accurately and in detail. The USA and Canada wall map also displays the most current information available at the time of its printing including capitals and cities, streets and roads, rivers and lakes, mountains and deserts, and much more. Elevation levels, which are portrayed by various levels of shading, are produced with the use of digital technology that is designed to accurately determine actual elevation, not simply the artist’s impression. 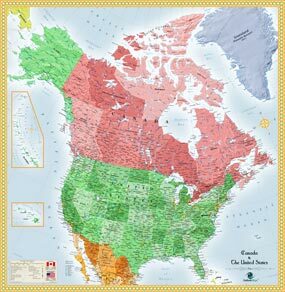 This USA and Canada wall map will make an excellent visual aide for classrooms, businesses, or individuals. The vibrant colors and sharp details ensure that it will look magnificent on display. Add this USA and Canada wall map to your own map collection, or give it as a gift this holiday season.